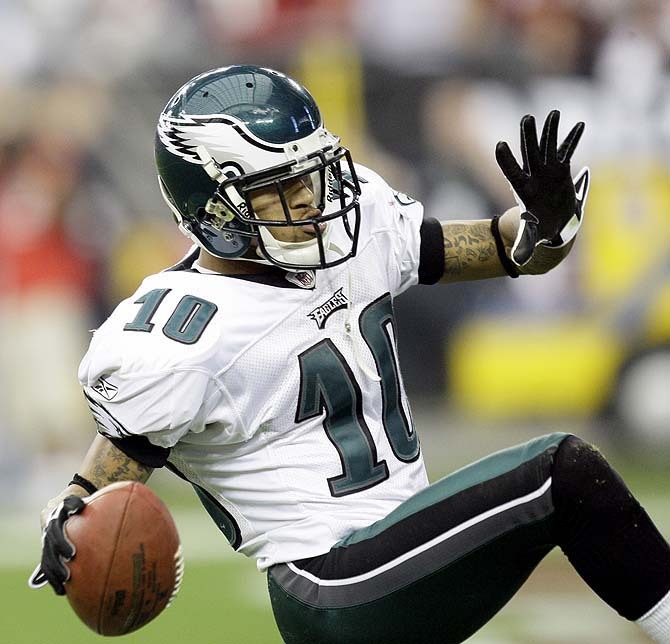 With about two months until the 2012 NFL Draft, the Eagles still have a lot of needs to address. Most fans know that the defense needs to be addressed, but we're going to look a little into the offense as well. Let's face it. The wide-nine defense implemented by Juan Castillo didn't work for the majority of the season. However, some success in the last 4 games brought hope to some Eagles fans. Well Castillo is back for another go around, and with the comes the return of the wide nine. The biggest need for the Eagles, in my opinion, is the MLB position. No more toying around with Casey Matthews or Brian Rolle. The Eagles need a stud in the middle who can anchor the defense that gave up so many yards over the middle of the field. A guy that many thought the Eagles had their eye on was Vontaze Burfict from Arizona State. Burfict however, had a terrible combine, and could deter teams from taking him in the early rounds. If the Eagles are really interested in taking Burfict to anchor the middle of the defense, there's a possibility they take him in the 2nd or third round. (Hoping that his sub-par combine workout allows him to fall to later rounds). If the Eagles don't go after a LB in the first round, look for them to take a DT to solidify a defensive line that performed rather well last season. Now I'm a little biased here, but I think Devon Still from PSU would be a great fit in the middle of the Eagles D-Line. He's a big strong DT that can take on blockers, fill space, and get after the QB. By now you've probably heard that yesterday on 97.5 FM The Phanatic, Plaxico Burress said nothing would make him happier than being able to join the Eagles for the 2012-2013 season. Plax would be a great compliment to the speed that the Eagles have on the outside with Maclin and Jackson. Plax is one of the top red zone receivers in the league, and we all know how much help the birds could use close to the end zone. Finally, let's look at the QB position. Vick is not the long term solution we were all hoping for, let's be honest. He isn't as accurate as we thought he could be, doesn't seem to want to run as much anymore, and is way too injury prone. With backups Kafka and new signee Trent Edwards, the Eagles could look to draft a QB they think they could develop for a few years down the road. What are your thoughts? Who should the Eagles go after in the draft or in Free Agency? It is stunning. Simply stunning. With a win tonight against the Sharks (32-22-7), the Flyers (34-20-7) could take 6 of a possible 8 points on their four game western road trip. It is remarkable that this is the case considering it has felt like they have not played their best hockey. The first game of the road trip was a 5-4 overtime win in which the Flyers scored in the final 10 seconds of the third period to tie the game. They then got shutout in Edmonton and Saturday fell behind 3-0 only to come back and win 5-4 in a shootout. Yes, they won in a shootout. The Sharks have struggled mightily of late. They have won just three of their last 12 games. Tonight they will be without head coach Todd McLellan who is suffering from concussion-like symptoms after being hit with a stick during Sunday’s game. You know things aren’t going your way when ever your coach is out with a concussion. Puck drops tonight at 10:30 pm in San Jose. The game can be seen on the NBC Sports Network (formerly Versus) and heard on 94.1 WIP. Flyers still fielding calls on JVR.San Jose believed to have made an offer, but so far Philly isn't willing to move him.#tradecentre. The Sharks made an offer to the Flyers today for JVR, but apparently it wasn't sweet enough to make a deal. No one is quite sure what the pieces of the deal were. San Jose's goalies are Antti Niemi and Thomas Greiss. The Sharks currently sit at 7th in the west. Flyers looking for #1 Goaltender? According to TheFourthPeriod.com, the Flyers are still looking to make a move before today's 3pm trade deadline. The rumor out there is that they are trying to make a package deal to a team out there willing to part with their top net minder. JVR has been the headliner of all of the previous rumored deals, especially in the Rick Nash saga. Now, JVR is now supposedly being paired with back up goalie Sergei Bobrovsky in order to look for another goalie. There are three candidates that are the Flyers supposed targets. The Flyers have little cap space remaining but a two-for-one trade before 3pm should be able to work out. This week's rankings were the hardest for me to formulate. Temple lost for the first time in 11 games, and despite being the most talented team in the city deserved to lose its top spot. The big question is what to do about Drexel? The lack the quality wins and RPI numbers that St. Joe's possesses, but it is impossible to ignore Drexel's resume. To the potential dismay of Hawk fans, I'm placing Drexel number one in the city. Drexel has won 17 games in a row and 23 of their last 24 contests. They have won outright the Colonial Title and have passed the 'eye-test' of many analysts. If Drexel fails to win the CAA Tournament and do not find themselves in the tournament come Selection Sunday I am calling shenanigans. It was too difficult for me to place Drexel lower in the rankings without them losing. Flyers Still In On Nash? #Flyers HAVE been still talking to Columbus about Nash, but nothing serious has developed. Jackets want several of #Flyers' young players. The next 22 hours will be interesting. If Matt Carle suits up for the Flyers on Tuesday night in San Jose, it isn’t because there weren’t suitors for his services. The 27 year old defenseman is scheduled to become an unrestricted free agent this summer and is looking for a big payday. That payday is not expected to come from the Philadelphia Flyers. Carle has 4 goals and 27 assists for 31 points this season. He was acquired at the beginning on the 2008-2009 season from the Tampa Bay Lightning for fiery forward Steve Downie. Andy Strickland of TrueHockey.com reports that the Chicago Blackhawks are interested in acquiring Carle. The NHL trade deadline is 3 pm EST tomorrow. Could Desean Jackson be on his way out of town? The explosive receiver is expected to be franchised by the Eagles but ESPN’s Adam Schefter is reporting that the Eagles are listening to trade offers for Jackson. The 25 year old receiver had 58 receptions for 961 yards and 4 touchdowns last season. His subpar play and lackluster attitude had many questioning whether Jackson was giving 100% effort. Jackson was a holdout for part of training camp in hopes of getting a long-term contract from the Eagles. The Eagles threw lots of money around but Jackson got nothing. It is no surprise the Eagles are trying to get some compensation from the Pro Bowl receiver. Eagles are open to listening to trade offers for free agent wide receiver DeSean Jackson, who is expected to be franchised. Just to clear the air: No these aren't the new Eagles helmets. With the NFL apparel switching from Reebok to Nike for the 2012 season, many have speculated about if the teams are going to change their uniforms/helmets and what they might look like. A lot of concept ideas have come out and here is a recent one. Brandon Wenerd of BroBible.com has a list and pictures of every team’s concept helmet. Some teams have two helmets. The Eagles only helmet is pictured and one of the coolest designs of all (in my opinion) is the Oakland Raiders helmet below. Some teams should consider the switch while others should not.